(Bloomberg) -- International Business Machines Corp. fell the most in six months after reporting a decline in revenue from the cloud-computing, artificial intelligence and cognitive software unit that the company is hanging its future on. IBM reported a 2 percent drop, to $5.0 billion, in sales from cloud and cognitive software, in the three months ended March 31. Cloud revenue alone grew 10 percent over the last 12 months, but that was a slower pace than the previous quarter. Revenue across all of IBM’s business units either fell or was little changed, according to a company statement Tuesday. The shares fell as much as 6 percent to $136.26 Wednesday morning. It was their biggest intraday decline since October. Edward Jones technology analyst Josh Olson said he still had reservations about IBM’s future growth prospects even with Red Hat under its wing. 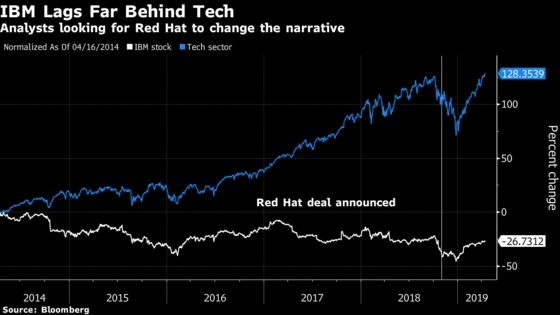 “IBM’s acquisition of Red Hat Software, while compelling strategically, carries significant integration risk and a high cost that may be difficult to justify,” Olson wrote in a recent note. IBM will need to see “significant revenue and cost benefits" to rationalize the rich price Rometty paid, he wrote in a note before the earnings were released. The company’s consulting services -- a combination of its Global Business Services and Global Technology Services units – pulled in a combined $11 billion, representing about 60 percent of IBM’s overall revenue.